I made a plan, set my deadline, and followed through -- unbelievable but true. And what do I have to show for it? The Rebecca Cardi is FINALLY done! After seemingly endless pattern futzing -- and critical, German-engineered pattern decoding support from Alison -- the fit turned out pretty good! The arm length was perfect before I started steaming the bejeezus out of the armhole sleeve seam, and now they're a tad long-ish. 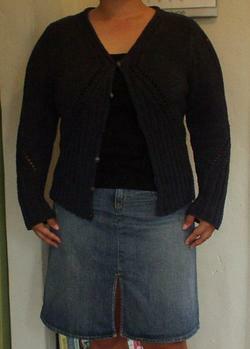 And I love the ribbing / eyelet lace detail -- Rebecca patterns rock! -- and the All Seasons Cotton really shows it off well. Great job! It looks good! I've ordered some All Seasons Cotton in 'Tapestry' for this project and hope to tackle it before the summer is over! Your sweater is so pretty! And it is very flattering on you too! Nice job! That sweater is gorgeous and looks great on you. I have been admiring this pattern for a while and finally ordered the magazine today. I have to significantly upsize it for my 48" girth and would appreciate if you could answer a question for me. What kind of ease did you use for this sweater? 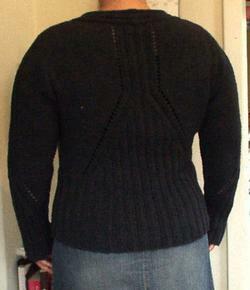 Like if the sweater measures 38", is your bust measurement 38"? Thanks so much if you get a chance to answer me. I just came across you blog. It's a little late...I just have to say that I love your cardi!! Fabulous work. I need to make her!